DOCTOR WHO: We Will Remember Them... | Warped Factor - Words in the Key of Geek. Tony Fyler weighs the evidence for and against the Cyber-Brigadier. So was this idea a fitting tribute, or a disgrace to the memory of the character, to the memory of Nicholas Courtney, and by extension to all the fallen soldiers who died protecting the future in which we live from forces of Earthbound evil? Both views have spread across the internet since the episode aired – but which, if either, is ‘right’? The answer is probably both, depending who you are and how long your association with Who goes back. If you’re a relative newbie, or have come to understand the Brigadier through DVDs, then you’re probably (and in very general terms – this is one of those issues where pinning anything to the wall as Holy Writ is massively foolish) more likely to see the Cyber-Brig as a fitting tribute, and a good head-nod to the past in a story that was absolutely full of such nods (Chaplet Funeral Home, anyone? The Cyberman sitting up on the slab and pulling off the shroud? The Tombs?) Having referenced the Brigadier through his portrait, what could be more fitting than that he should save the Earth and the Doctor one more time in their hour of direst need, and get the salute he always wanted from the Doctor – an acknowledgement of how much the Doctor owed and respected him. If the Second, Third or Early Fourth Doctors were ‘your’ Doctor though, and particularly if you were a Pertwee devotee at the time the programmes first aired, your emotional connection to the Brigadier is likely to be stronger and more complex, knotted into your own childhood. If Roger Delgado’s Master was the Moriarty to Pertwee’s Holmes, then the Brigadier and the Boys were Lestrade and the Scotland Yarders – an essential part of what made the drama and the fun work in those circumstances. 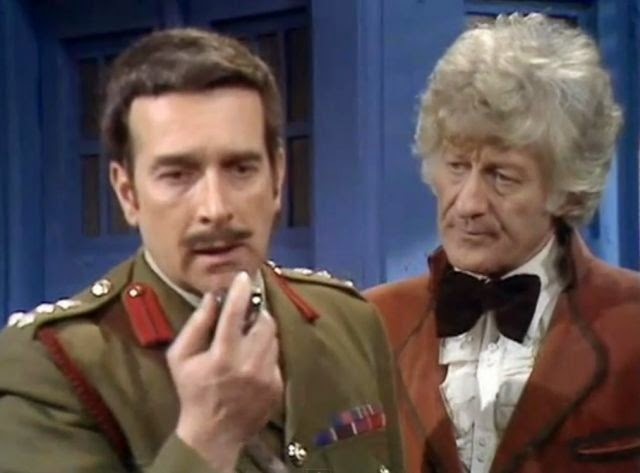 So the DNA of your fandom is likely to be inseparable from the idea of the Brigadier as the pompous but effective soldier who was always ready to back the Doctor in public and with force of arms, even if privately they argued and bickered about the scope of the world. 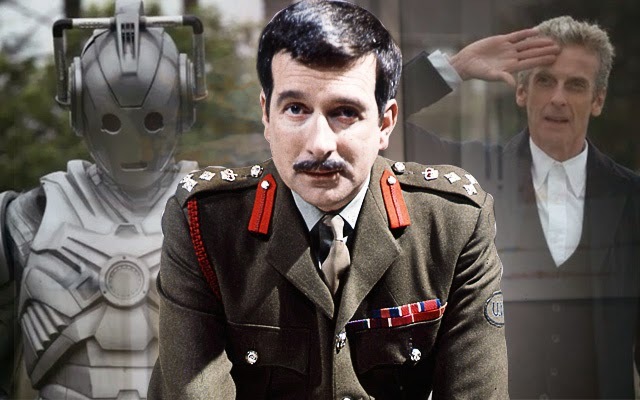 There’s likely to be an instinctive punch in the gut at seeing ‘The Brigadier’ played by anyone else, even in Cyber-form, and there’s likely to be a roar of outrage in your belly that the Brigadier of all companions should be lessened to the extent that he becomes a Cyberman. In an age where the companions of the Doctor have had more and more to prove that they’re extraordinary, above the mass of humanity in their skills and abilities, it feels like a betrayal that the first companion ever to really do that over a long period – to be a soldier but to have an open enough mind to trust the Doctor – should be rendered on screen as one of a species for whom individuality and specialness is anathema. So beyond the terribly clever and smugly Whoish answer that the Cyber-Brigadier was “both things, depending on how you look at it”, what can we say about the inclusion of the sequence? First, it was undoubtedly well-intentioned. Steven Moffat is by no means above putting things in just to outrage fans (and neither was Russell T Davies), and it’s right that he shouldn’t be. The relatively unflattering name of ‘Ming-Mongs’ was developed by RTD to described the fans for whom nothing will ever be right, and Moffat in particular is a great baiter of the Ming-Mongs, but even he’s unlikely to have sat in his Cardiff office and thought ‘I know – let’s desecrate the memory of the Brigadier, that’ll be fun.’ No – Moffat’s a fan of that precise era where the Brigadier ruled supreme, so undoubtedly he intended the Cyber-Brig to be a heartfelt tribute, a moment of emotion in a slate-grey scene, and a way of both having his death-toll cake and eating it in terms of UNIT’s new finest, Kate Lethbridge-Stewart. So does its good intention make it right? Not automatically, no – it’s still possible to be perfectly well-intentioned and get the tone utterly wrong (New Paradigm Daleks, anyone? ), but the intention does at least mean there’s no justification for hate-mobs to storm the BBC in Cardiff. Then there’s the storytelling angle. If we properly absorb the horror of the story that Moffat dared to tell in this Series, everyone who has died as long as Humanity has had a concept of the Afterlife has been uploaded into the Nethersphere when they died. Katarina of Troy – there in the Nethersphere. Sarah Kingdom and Brett Vyon – Nethersphere. Sarah-Jane Smith – Nethersphere. Harry Sullivan – Netherspere. Geoffrey Noble – Nethersphere. Amy and Rory Williams – Nethersphere. All there, all potentially downloaded into new bodies, assuming they were buried (we’ll ignore the gaping plot hole that most of the graves of planet earth will be filled with just skeletons, not brains to download to for now – everyone else seems to have done the same). If we take that as being part of the fundamental horror of the storyline, then what we have is a basis from which any or all of them could be Cybermen somewhere on the planet in Death In Heaven. That in turn means what you need is an impetus to break the Cyber-conditioning – and we’re given that when Kate is unceremoniously ejected from the plane. Perhaps it’s registering that his beloved daughter’s going to die that allows the Brigadier to break the cyber-conditioning, and after that, he follows events closely, ready to do his best for the planet one more time if and when he can. So the intention was good, and the storyline does allow, with a bit of a forgiving attitude, for the action of the Cyber-Brigadier to make a kind of sense. So does that make it alright? Well, tentatively, yes. To those who grew up with Nick Courtney’s note-perfect military man, it will always feel at least a little cheap. To the Ming-Mongs it will always be an example of how ‘Moffat is destroying Doctor Who’. And the timing of the episode was unfortunate, falling as it did on the day before Remembrance Sunday in the UK – the day to remember the fallen soldiers of Humanity’s conflicts. But in story terms it worked, while giving a telling counterpoint to Danny’s soldierly weeping – if the Brigadier ever cried about his actions, he did it off screen. Unlike Danny, he was able to see the Doctor’s point of view, and he was always there in the nick of time to stand between his planet and those that sought to menace it. If ‘love is a promise’ that can break through Cyber-conditioning, then the Brigadier saving his daughter despite his conversion makes sense. And if love is a promise, then surely the duty of a soldier who allowed himself to be touched by the Doctor’s open mind is a promise too, driving the Brigadier to save the Earth one last time, and save the Doctor’s soul into the bargain, by doing the necessary thing the Doctor couldn’t bring himself to do. Saving the Earth and doing the necessary thing the rest of us cannot bring ourselves to do, is after all, what the soldiers did who died in our conflicts. The soldiers we remember on Remembrance Sunday. 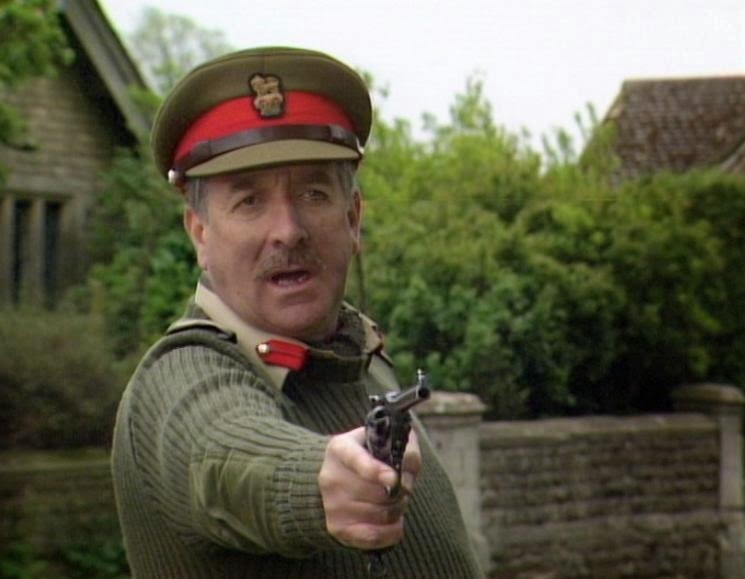 Of course the Brigadier is fictional, but he is Doctor Who’s enduring tribute to all that is good and all that is bad about the life, the duty and the choices of a soldier. So through him, and particularly in his actions in Death In Heaven, we can remember all those who stood with just their lives and their courage between the Earth and those who would have made it a Hell in their own image.